Indian gold imports: High but ignore the hype! 13 Jul 2017 – Indian gold imports this year have already surpassed the full year 2016 level, but its probably best to ignore some of the year on year growth media hype given how low the figures were for H1 2016. 12 Jul 2017 – Any impact on the supposedly temporary enforced closure of Tahoe Resources’ Escobal mine, the world’s second largest primary silver mine by Guatemala’s supreme court may only have a very limited impact on global silver fundamentals and the metal price. 11 Jul 2017 – In the past year the palladium price has moved up and platinum down and there is a real prospect of the former overtaking the latter in the near future. So what’s happening to gold – and silver? 10 Jul 2017 – Gold, which had been showing signs of strength saw some huge trading volumes late last week which prompted a price slump, while silver fared even worse with the GSR rising to almost 80. 04 Jul 2017 – H1 commodity price changes very positive for palladium while gold rise pretty well matches fall in dollar index. Silver disappoints. Iron ore worst performer. 04 Jul 2017 – After a blip in May, Chinese gold demand as represented by Shanghai Gold Exchange withdrawals is now a little higher than at the same time a year ago, but still well down on the record 2015 figure. Gold Today –New York closed at $1,248.90 yesterday after closing at $1,258.70 Wednesday. London opened at $1,248.20 today. – The $: € was slightly stronger at $1.1120 after yesterday’s $1.1131: €1. – The Dollar index was stronger at 97.73 after yesterday’s 97.57. – The Yen was weaker at 111.25 after yesterday’s 110.77:$1. – The Yuan was weaker at 6.8929after yesterday’s 6.8902: $1. – The Pound Sterling was weaker at $1.2950 after yesterday’s $1.3036: £1. The Shanghai Gold Exchange trading level towards the close translates into $1,257.34. New York closed at a $8.44 discount to Shanghai’s close yesterday. London opened at a discount of $9.14 Shanghai’s close today. As you can see above, Shanghai did not pull back today as far as New York did. With Shanghai now proving less volatile than London or New York we expect the pattern being formed now will lead to Shanghai giving a better indication of the direction of the gold price. At the moment that is higher, after this consolidation. Silver Today –Silver closed at $16.61 yesterday after $16.89 at New York’s close Wednesday. LBMA price setting: The LBMA gold price was set today at $1,251.85 from Thursday’s $1,261.35. The gold price in the euro was set at €1,120.68 after yesterday’s €1,135.02. Ahead of the opening of New York the gold price was trading at $1,253.00 and in the euro at €1,121.55. At the same time, the silver price was trading at $16.80. With the gold price shrugging off potential falls, we now expect to see it trade in a tightening range until the gold market is in balance, before the next strong move either way.The dollar is slightly stronger today in what is a normal market reaction, but we do not expect this to last for long. While the list of GST levels to be imposed in July has now been issued, the duty to be levied on gold [and services] is still to be finalized. It is expected to be 3%. When we look back at the actions of Modi and his government in India and on gold, since he came to power, we see that Indian governments are still unhappy with gold in the country and will always be. This is not a small problem for that government, when you consider that the total gold holdings of the world’s central banks is around 34,000 tonnes, private citizens and institutions in India hold around 24,000 tonnes, an amount that is rising by around 1,000 tonnes a year. Why their dislike? Because gold lies outside government control, just as it did in the U.S. before it was confiscated in 1933. Thereafter, when all U.S. citizens could only use banknotes and the banking system, the U.S. government completely controlled the financial system. All governments need to do that if they want total control of a nation’s finances, despite any objection from their own people. Every attempt to pull the Indian gold trade into the Indian banking system [as it is in the west] has failed and will continue to fail because of the financial mistrust between the government and its citizens. But gold in India is far more to its citizens, than it was to U.S. citizens, prior to 1933. In India, it is tied in with religion, family as well as financial security. It is part of the fabric of society. This is unlikely to change in the future. It is unlikely, that any ban on gold dealing there would work because it didn’t work in the past. Gold ETFs – Yesterday, saw sales of 1.184 tonnes from the SPDR gold ETF (GLD) but purchases of 0.53 of a tonne into the Gold Trust (IAU). Their holdings are now at 850.891 tonnes and at 202.82 tonnes respectively. With U.S. inflation rising, a March rate hike now looks all but imminent. Many economists—including the Goldman Sachs economists I had the pleasure to hear speak this week—expect to see at least three such hikes this year alone. Gold responded accordingly, closing above $1,240 for the first time since soon after the November election. Below you can see the gold price charted against the inflation-adjusted 10-year Treasury yield, which is now in subzero territory. The question I have is: Why would an investor deliberately choose to lose money? But that’s precisely what’s happening now with inflation where it is. I view gold as the primary global currency. It is the only currency, along with silver, that does not require a counterparty signature. Gold, however, has always been far more valuable per ounce than silver. No one refuses gold as payment to discharge an obligation. Credit instruments and fiat currency depend on the credit worthiness of a counterparty. Gold, along with silver, is one of the only currencies that has an intrinsic value. It has always been that way. No one questions its value, and it has always been a valuable commodity, first coined in Asia Minor in 600 BC. Although major stock indices continue to hit fresh all-time highs on hopes of tax reform and fiscal stimulus, it’s important to temper the exuberance with a little prudence. The bull market, currently in its eighth year, is facing some significant geopolitical and macroeconomic uncertainty, and we could be getting late in the economic cycle. This makes gold’s investment case even more attractive. 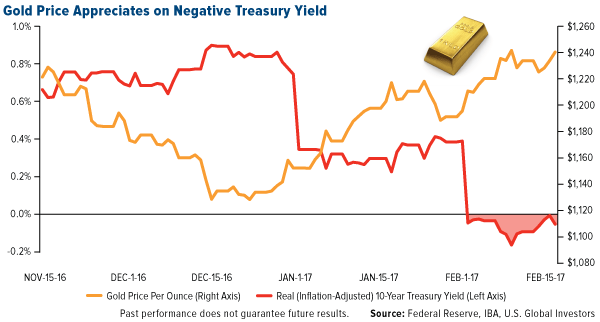 For the 10-year period, the yellow metal has shown an inverse correlation to risk assets such as stocks and high-yield bonds. It might be time to ensure that your portfolio has the recommended 10 percent in gold—that includes 5 percent in gold coins and jewelry, the other 5 percent in quality gold equities and mutual funds. The long-term investment case for gold looks just as compelling following bullish reports last week from PricewaterhouseCoopers (PwC) and Morgan Stanley. China and India are the world’s top two consumers of gold, and both countries are expected to make huge economic gains in the next few decades. This is likely to boost gold demand even more, which has a high correlation with discretionary income growth. China alone consumed approximately 2,000 metric tons in 2016, or roughly 60 percent of all the new gold that was mined during the year, according to veteran mining commentator Lawrie Williams, who based his estimates partially on calculations made by BullionStar’s Koos Jansen. The 2,000 metric tons is a much higher figure than what analysts and the media have been telling us, but I’ve always suspected China’s annual consumption to run higher than “official” numbers. 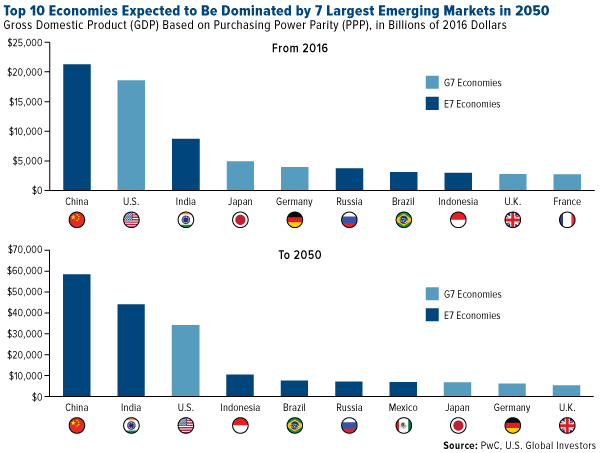 According to PwC’s models, China and India should become the world’s number one and number two largest economies by 2050 based on purchasing power parity (PPP). China, of course, is already the largest economy by that measure, but PwC sees the Asian giant surpassing the U.S. economy on an absolute basis by as early as 2030. I think it’s also worth highlighting Indonesia, which is expected to replace Japan as the fourth-largest economy by midcentury. E7 economies, in fact, could end up dominating the top 10, with Mexico moving up to number seven and France dropping off. You can see the full list on PwC’s site. Then there’s Morgan Stanley’s 118-page report, “Why we are bullish on China.” The investment bank sees a number of dramatic changes over the coming years, the most significant being China’s transition from a middle-income nation to a prosperous, high-income nation sometime between 2024 and 2027. 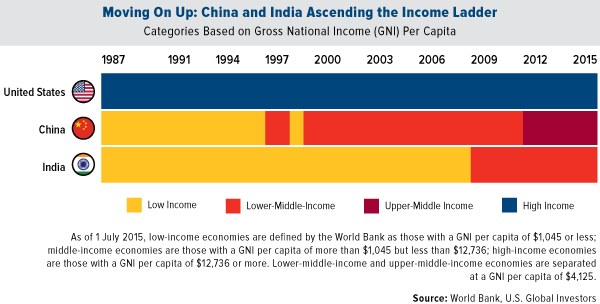 (The high-income threshold is a gross national income (GNI) of around $12,500 per capita.) This would make China one of only three countries with populations over 20 million that have managed to accomplish this feat in the past 30 years, the other two being South Korea and Poland. This trajectory is supported by a number of expectations, including, most importantly, Morgan Stanley’s confidence that China will manage to avoid a debt-related financial crisis, as some investors might now believe is forthcoming. The bank’s view is that the Chinese government will successfully provide “adequate policy buffers and deft management of the policy cycle” to ensure the growth of per capita incomes. 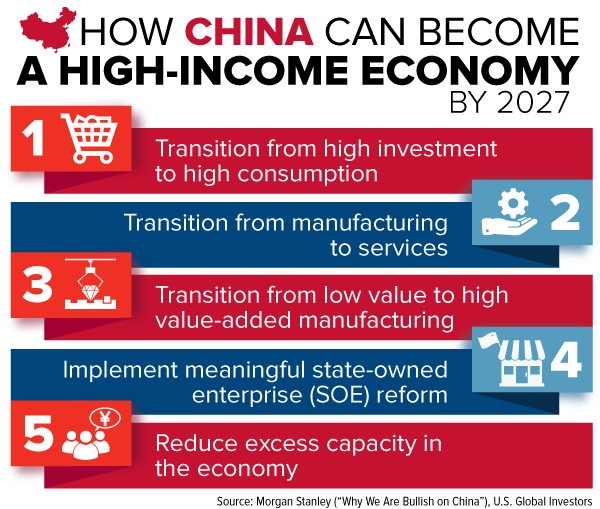 Other key transitions will additionally need to take place for the country to reach high-income status by 2027, including transitioning from a high investment economic model to high consumption and implementing meaningful state-owned enterprise reform. Although China is currently transitioning from a manufacturing economy to one that’s focused on consumption and services, the country will also need to emphasize high value-added manufacturing. In addition, since President Donald Trump has officially withdrawn the U.S. from the Trans-Pacific Partnership (TPP), China could very well use this as an opportunity to take the lead in global trade, Morgan Stanley writes. This view aligns with comments I’ve previously made. China is already reportedly weighing its options with two alternative free-trade agreements (FTAs), one that includes the U.S. (the Free Trade Area of the Asia Pacific) and one that does not (the Regional Comprehensive Economic Partnership). It’s probably safe to say, however, that given Trump’s opposition to FTAs, trade negotiations involving the U.S. are unlikely to happen anytime soon. Taken together, this is all good news for gold. Again, when incomes rise in China and India, gold demand has historically benefited. But it also makes China a compelling place to invest in. And yet investors have tended to be shy, underweighting the country for at least a decade in relation to the broader emerging markets universe. This, despite the fact that China has largely outperformed emerging markets for the last 15 years. 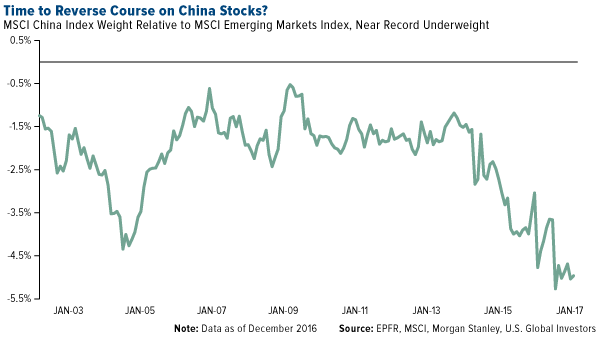 According to Morgan Stanley, the MSCI China Index has delivered a compound annual growth rate (CAGR) of 13 percent for the 15-year period, versus the MSCI Emerging Markets Index’s CAGR of 10 percent over the same period. Gold tends not to leave India once it enters. As the world’s largest importer, the country consumes massive quantities of the yellow metal—it’s on track to take in 900 tonnes of the stuff this year—where it remains in private families’ coffers, mostly in the form of jewelry and decorative heirlooms. It’s estimated that less than 10 percent of all Indian gold demand is in bars and coins. That might change this month—strong emphasis on “might”—as the India Government Mint will issue its first-ever sovereign gold coin, just in time for the fall festival season, which kicks off November 11. 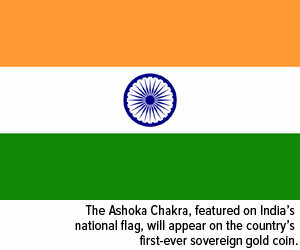 The coin will reportedly feature the Ashoka Chakra, the traditional 24-spoked symbol that appears on India’s national flag. Consider the immense popularity of the American Eagle, the Canadian Maple Leaf, the British Sovereign, the South African Krugerrand and others—and now this month, India’s coin will join their exalted ranks. You might wonder why India, whose notoriously insatiable demand for gold stretches back millennia, has only recently decided to join other nations in issuing a sovereign gold coin. The answer has much to do with the government’s interest in trimming massive net inflows of the yellow metal and containing its impact on the country’s trade balance. As I said, gold is so highly-valued by Indian citizens that once it enters the country, it stays in the country, largely as family heirlooms. The World Gold Council estimates that 50 percent of Indian wedding expenses is on gold. And when you consider that about 20 million weddings occur each year on average in India—many of them featuring gold in some capacity—it becomes very clear that this affinity to the precious metal is shared by all. Furthermore, because many Indians distrust government banks, they prefer to protect their financial security by holding physical gold. And who can blame them? India’s own central bank holds more than 557 tonnes of the metal for the very same reason: financial security. But apparently the government takes the position that you can have too much of a good thing, even something as precious and auspicious as gold, and therefore seeks greater control on how it manages net inflows. “Such an Indian gold coin would help reduce the demand for coins minted outside India and also help to recycle the gold available in the country,” says Arun Jaitley, India’s Minister of Finance. But will Indians be buying? It’s probably too early to tell. What can be said is that the plan to issue the coin is part of a broader government strategy to change the way Indians invest in gold. I always say that government policy is a precursor to change, and the new policies announced back in the spring are scheduled to go into effect soon. One such program involves a gold bond, “which would not be backed by gold,” explains Jeffrey Christian, a managing partner at commodities consultancy group CPM Group, who spoke recently at the Denver Gold Forum. Instead, the bonds would be issued by the Reserve Bank of India, the underlying assumption being that some Indians would prefer gold-indexed bonds to actual bullion. “And so they think that they can discourage physical gold demand because it put stress on [the government’s] current account balances a few years ago,” Christian says. Then there’s the so-called “gold monetization scheme,” which is a program designed to encourage individuals and temples laden with gold to voluntarily deposit some of their bullion in exchange for a “2 percent or more” interest rate. Theoretically, the gold would be held on deposit. In practice, however—again, according to Christian—it would be lent or sold to the jewelry industry, thereby reducing gold imports. This means, of course, that the bullion—including everything from gold trinkets to cherished wedding ornaments—would be melted down. 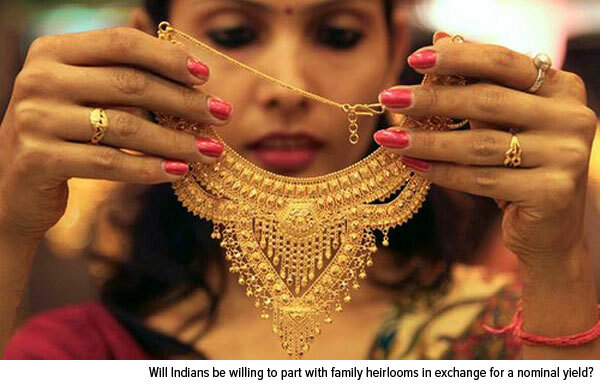 “Not many [Indians] would want to see their long-preserved, family-inherited, emotionally-attached piece of yellow metal lose its identity and ‘feel’ by melting it for meager return,” writes columnist Dinesh Unnikrishnan of Indian news agency Firstpost. The government’s multifaceted strategy might not be as drastic as the one enacted by President Franklin Roosevelt in 1933, which forbade the “hoarding of gold coin, gold bullion and gold certificates within the continental United States.” For now, Indians’ participation in the two progressed programs is completely voluntary. 1. Are you interesting in buying an Indian sovereign gold coin? 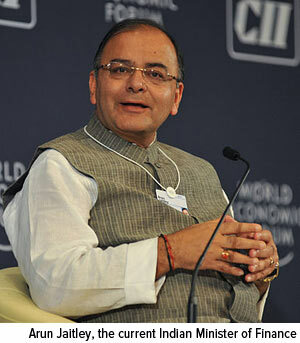 The Indian budget did not lower duties on the import of gold into the country as was expected. However, the wholesalers who had held back on stocking up until they knew if the duties would be lowered or not, will now move into the market to stock up, knowing now that there is no reason to wait any longer. Very little in India follows a straight line, so smuggling will continue to make up any shortfall in demand albeit at only slightly lower prices. When duties are high, legitimate import routes drop as smuggling grows, so now that there is no hope of duties falling now, we expect to see the volume of smuggling continue at present levels, or rise from now on. Demand for gold in India, even with the 10% duty has been on the rise of late and is expected to rise further in 2015 as the gold buying classes of India become wealthier. With the country set to see strong economic growth under the Modi government this trend will continue to rise for the foreseeable future. Because nothing is straight and definable when it comes to true gold imports, any import numbers that are quoted are inaccurate, because of illegal entry routes for gold into the country. We sometimes see tonnages of gold smuggled into the country quoted. Of course, these are completely inaccurate. We are of the opinion that annual gold imports are of the level of previous records before duties were raised in August 2013 of 1,200 tonnes, simply because the premiums on legitimate gold are low, implying that demand is being met nearly fully [from both legal and illegal entry points] This total is on the rise, constantly. The euro lurched lower on Friday to $1.1187 but has risen slightly to $1.1225 today with the dollar index at 95.17. There is strong resistance in the marketplace against further rises in the dollar. Will this continue? If it does we expect to see gold and silver rise in the dollar. New York closed Friday at $1,211.1 up $2.70. Asia took the gold price up to $1,221 before London pulled it down to $1,214. London then Fixed the gold price at $1,216.75 up $11.75 and in the euro, at €1,084.931 up €11.339, while the euro was almost unchanged at $1.1215. Ahead of New York’s opening, gold was trading in London at $1,213.60 and in the euro at €1,081.01. The silver price closed Friday at $16.57 up 3 cents. Ahead of New York’s opening it was trading at $16.60. Again there were no purchases or sales into or from the SPDR gold ETF or from or into the Gold Trust on Friday. The holdings of the SPDR gold ETF are at 771.249 tonnes and at 166.43 tonnes in the Gold Trust. The silver price is moving up cautiously watching to see if the gold price moves back to its recent high of $1,270. We expect it to run ahead of gold, should the gold price move through $1,230. Chinese gold demand discrepancy explained? The apparent difference between what we will describe as Chinese ‘consumption’ and Chinese ‘total demand’ is thus huge. WGC/GFMS calculates ‘consumption’ as being made up only of jewellery, technology and investment demand and in mainland China’s case this came to around 814 tonnes in 2014, around 38% down from that of 2013. But with SGE withdrawals coming to a little over 2,100 tonnes in 2014 – which some equate to total Chinese demand – this leaves a tremendous gap of almost 1,300 tonnes in the two different calculations. The WGC will tell you that there is an element of double counting in the SGE withdrawal figures, but admits this is probably small, only relating to some recycled gold, and now suggests the balance is held by Chinese banks (which it classifies as stocks and therefore doesn’t include the figures in its demand classification). So perhaps we should look at ‘gold flows’ rather than various definitions of ‘consumption’ or ‘demand’ and in this respect ‘gold flows’ from West to East – and into China in particular were very large indeed in 2014 – indeed may have been greater than in 2013 given the big recovery in Indian ‘demand’ which doesn’t appear to be distorted by bank inflows. If we use ‘gold flows’ as a measure the amount of gold ‘flowing’ into China hugely exceeds that ‘flowing’ into India, although on WGC ‘demand’ figures India seems to be interpreted by the media as having regained the world No. 1 spot. In truth it probably hasn’t really been the No. 1 for three or four years already given this additional, but unconsidered, demand from the banks. Indeed even this year if one adds Hong Kong ‘demand’ into that of the mainland, Chinese demand as calculated by the WGC was still a little ahead of India’s. The WGC is very excited by what it sees as a big turnaround in Indian jewellery demand, particularly in Q3 and Q4 last year. It puts this very much down to a change in attitude in the Indian jewellery trade following the election of the Modi government which is, on the face of things, much more pro-gold than its predecessor. There is a definite suggestion that gold import controls will be further reduced and there will have been some ability within the jewellery sector to respond ahead of likely tax changes. There is also anecdotal evidence that the incidence of gold smuggling to avoid taxes and the prior 80:20 import restriction has fallen back too. Speaking to the WGC’s Head of Communications, John Mulligan, at the big Cape Town Mining Indaba, and he was quick to point out that in addition to the big gold flows eastwards, an often overlooked statistic is that in Europe, German investment demand has been particularly strong. 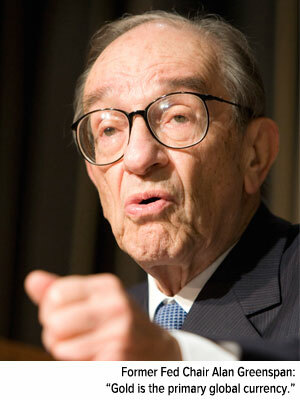 He reckoned that, in fact, German gold investors have been buying more than their U.S. counterparts since 2008! Other points from the latest Gold demand Trends report include comment that Central Bank purchases held up better than anticipated, largely due to buying from Russia and some other CIS states which between them accounted for around half of such purchases last year. Sales out of gold ETFs were at a fraction of those of 2013 and while new mined gold production grew by a small 2%, the WGC thinks that this may well have now plateaued so perhaps peak gold is at last upon us. There are few major new gold projects and expansions still in the pipeline, exploration has diminished drastically, while a number of older operations are facing closure through ore depletion, or because they can no longer mine profitably at current gold price levels and in many cases grades are falling. As always the latest GFMS update on its Gold 2014 report makes for interesting, if somewhat controversial, reading. Excerpt from commentary posted today on Mineweb.com – click on Mineweb.com to read full article. It’s also notable that some commentators take the latest GFMS update to show that India has re-overtaken China as the world’s largest gold consumer. We disagree – the figures just don’t add up! The latest update of the annual study by GFMS of world gold supply and demand makes for some interesting reading, and correspondingly interesting interpretations of the figures by the media. Mineweb has reported one such analysis suggesting that India has re-overtaken China as the World No. 1 gold consumer and some figures published within the report suggest that this may be the case – but this may well depend on what the interpretation of consumption actually is. The GFMS report suggests that Indian jewellery fabrication at 690 tonnes overtook that of China during the year, but appears to make no such bald statement that total Chinese demand fell back below that of India, although there are figures within the report which suggest this could be the case.